My love for chocolate goes way back. As a child, I can remember putting a piece of chocolate in my mouth and letting it melt. The favors, the creaminess, the sweet and dark undertones made my mouth explode in a whole new way. I wanted more of this incredible delight, as it made my heart feel full instantly. Fast forward into my teens, when I thought that calories were the devil. I knew chocolate was full of them and a shouldn’t eat it. I wanted to taste that delicious rich chocolate again but continued to deprive myself. When I did allow myself to eat it, I felt horrible that I gave in and would cram it all into my mouth and eat it as fast as I could. There was never any savoring or experiencing the true texture and flavors. After, I would eat a bunch and would feel worse. I would feel unsatisfied. I felt this longing for that taste I once experienced. But couldn’t let go of the feeling of guilt and shame around once used to be my favorite treat. Today, I can say that I have a new found friend in chocolate, one that is a loving one. I now choose to savor every bite. Feeling it radiate through my body. Noticing all the flavors and textures. It is almost like a meditative experience. When we allow ourselves to taste and experience food without guilt we no longer need to eat the whole box because we are experiencing the wholeness of that food and the beautiful experience it brings while eating it. 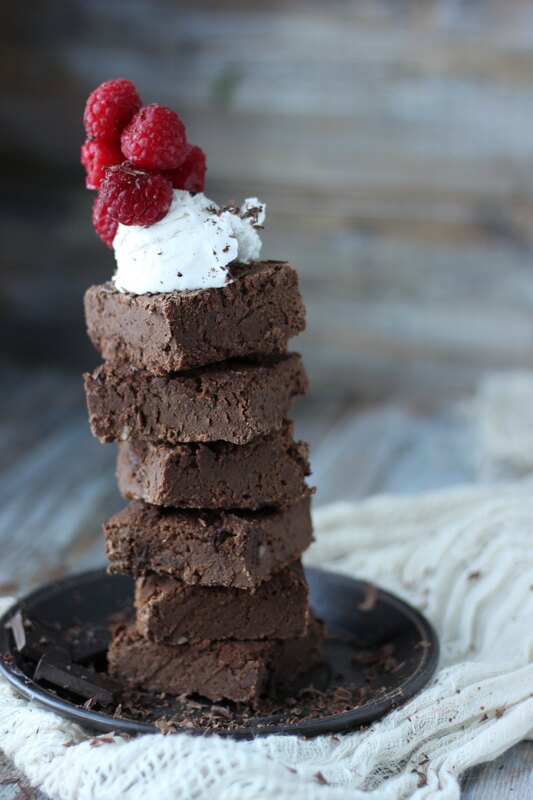 These chocolate brownies are low in sugar, high in fiber (from black beans) and the best part is that they are really creamy! When I topped it with the whipped cream and raspberries it was the perfect blend of sweet and sour. It takes brownies to a whole new level in your mouth. Yes, I only needed to eat one because when I did, it wasn’t in front of the TV or computer. It was in my favorite chair, staring out into the world and having a special sacred moment with my brownie. This is what food should be a sacred experience. I hope that you take the space in your life after you make these delicious healthy brownies to just be and experience the journey of eating chocolate like when you were a child. Grease your 12X6 glass pan with oil. Puree the beans into a paste using your food processor or a potato masher. Add in beans, eggs, vanilla, sugar, coconut/avocado oil blend, peppermint extract, almond milk, applesauce, stevia, and pulse until combined. Add coconut flour, cocoa, baking powder and mix together making sure there are no clumps. Add wet and dry ingredients together. Mix and then add chopped up mint dark chocolate. Bake in the oven for 20-25 minutes. Until toothpick comes out clean.